The success of this city is evident in its impressive skyline, which appears to jut straight from the sea. Parts of the city, including the houseboat district of Aberdeen, actually are afloat. The best views are from Victoria Peak, and the best souvenirs at Stanley Market. Excursions also take tourists across the South China Sea to Macau to visit the Guia Lighthouse, the Temple of the Buddhist Goddess of Mercy and a casino for a chance at the tables. Driving from Chek Lap Kok International Airport car park number 1: Exit at Cheong Shun Road to Cheong Lin Road which lead you to Airport Road. Drive through the North Lantau Express Way which connects to Airport Road. Cross the Tsing Ma Bridge and take Route 3 Cheung Tsing Highway. Then drive across the Cheung Tsing Tunnel and take the Tsing Kwai Highway. When arrive at Mei Foo roundabout, take the West Kowloon Express Way which connects to Tsing Kwai Highway. Turn to Lin Cheung Road when arriving at Yaumatei. Then turn left to reach Wui Cheung Road and turn right to take the Canton Road. 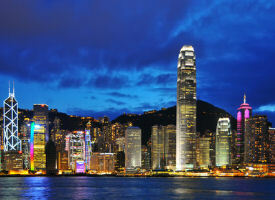 The Marco Polo Hong Kong Hotel is just next to Ocean Centre in Tsimshatsui at Canton Road. Taking the train from Chek Lap Kok International Airport: It will take about 30 minutes from the Airport to Kowloon Station by Airport Express Railway. Kowloon Station is approximately a 5 minute drive. Taking the bus from Ocean Terminal: Ocean Terminal is just 10 minutes walk from Nathan Road. There are buses connecting the Nathan Road at Tsim Sha Tsui and the airport. The time for traveling from airport to us is approximately 60 minutes. Driving from Hong Kong International Airport to Kai Tak Cruise Terminal: Leaving Airport and head south, turn right toward Cheong Shun Road, take the 1st left toward Cheong Shun Road, Turn right onto Cheong Shun Road, Turn left toward Cheong Lin Road. Turn left onto Cheong Lin Road, Turn left toward Cheong Lin Road. Slight left onto Cheong Lin Road, Slight left onto Airport South Interchange/Route 8. Slight left onto Route 8. Take the exit on the right onto Route 3, Take the exit toward Lin Cheung Road, keep right at the fork and merge onto Lin Cheung Road, Continue onto D1a(n) Road, Turn left onto Jordan Road, Turn right to merge onto Route 5. On Route 5 via Kai Tak Tunnel and keep left on Kai Fuk Road and take the exit toward Wang Kwong Road, Turn left onto Wang Kwong Road, Take the 1st right onto Sheung Yuet Road, Turn right onto Sheung Yee Road. Take the 1st right onto Wang Chiu Road, Take the 1st right onto Cheung Yip Street and the main entrance of Kai Tak Cruise Terminal located at the end of Cheung Yip Street. Driving direction from Tsim Sha Tsui to Kai Tak Cruise Terminal: Head northeast on Salisbury Road toward Hung Hom, Slight left to stay on Salisbury Road, Slight left onto Hong Chong Road. Take the exit on the right onto Route 5, On Route 5 via Kai Tak Tunnel and keep left on Kai Fuk Road and take the exit toward Wang Kwong Road, Turn left onto Wang Kwong Road, Take the 1st right onto Sheung Yuet Road, Turn right onto Sheung Yee Road. Take the 1st right onto Wang Chiu Road, Take the 1st right onto Cheung Yip Street and the main entrance of Kai Tak Cruise Terminal located at the end of Cheung Yip Street.